It is beautiful, comfortable, totally easy to drive, handles well, does everything I want it to do plus some. It turns heads no matter where I go. I've driven an Acura for seven years and was tired of mundane looks. The Evoque is a thing of pure beauty inside and out. 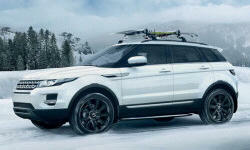 Why the 2012 Land Rover Range Rover Evoque? The looks of this SUV are a total winner. Nothing else like it on the market. Just outstanding. After being sold on the exterior styling and was compltely won over by what was on the inside. Beautiful, simple, elegant, superb quality, incredible color combination (ivory/dark cherry oxford leather with Madagascar wood). Wow. Performance is excellent. The four feels more like a V6. Strong acceleration with lots of torque/turbo pull at low end. I am also amazed at the vehicles off-roading capability - it's great. I live in San Francisco and am always driving up and down the hills so my mileage is not at all 'normal' but I still manage to squeak out about 15-16 around town. Driving out of town (but not highway) I get about 20-22. Have not yet driven very much highway but I expect it will be good. My only complaint about the Evoque is that it is skimpy on a few small but meaningful features. There is a lack of expected features such as sunglass holder, etc. Also a power tilt/telescoping wheel would be nice when two drivers are involved but that may be due to the off-roading requirements. Why Not the 2012 Land Rover Range Rover Evoque? I hane Acura that I use for tossing around. I expect the Evoque would be out of character on a course. I drive it 'nice'. I'm used to a performance ride (Acura TSX) so the Evoque feels fine to me - as I expect an off-road capable vehicle would be. If you want a smooth ride get the J. The great off-roading more than compensates for a slightly stiffer ride. The Evoque is quiet - better than my Acura. I'm short but find the driving position quite good. Some people might complain of the up/down actions of the power seat but it is fine for me.